SpaceX have opted to slip their next two missions, to allow for corrective work on the upper stage engine. 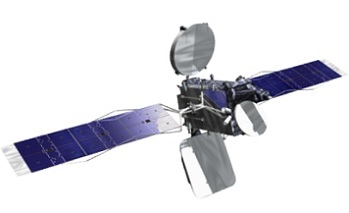 The company’s Falcon 9 v1.1 is now set to launch with the SES-8 spacecraft no sooner than November 12, with the Thaicom-6 satellite set to follow just one month later. Both launches will take place from Cape Canaveral’s SLC-40 launch complex. The debut launch of the upgraded Falcon 9 successfully deployed Canada’s Cassiope spacecraft into orbit on September 29. 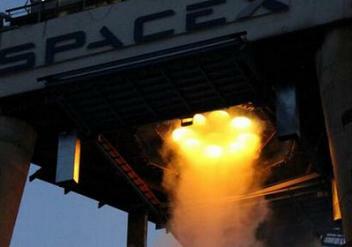 However, after safely deploying its payloads, the upper stage was then set to restart its Merlin VacD engine for a second burn related to SpaceX’s ambitions to create a fully reusable launch system. An anomaly with the restart held no mission impact, but the company’s CEO and chief designer, Elon Musk, did note they expected to implement corrective actions ahead of the next launch. “In the case of the upper stage relight, we initiated relight and the system encountered an anomaly and did not complete the relight. We believe understand what that issue is and should have it addressed in time for the next flight of Falcon 9,” he noted. Although details as to what SpaceX plan to do to “iron out” the issue are understood to be proprietary, the company decided to delay the next launch, per L2 information, from November 1 to November 12, to allow engineers to work on the problem. This next launch will be the Falcon 9 v1.1’s debut from SpaceX’s SLC-40 at Cape Canaveral, tasked with lofting the SES-8 satellite into a geostationary orbit, a mission profile that requires the upper stage to restart for what will be two required burns. 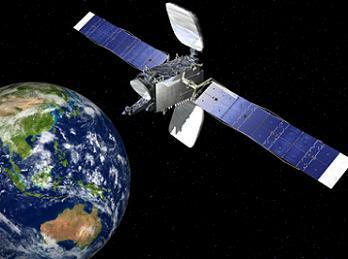 The spacecraft is a hybrid Ku- and Ka-band spacecraft – the sixth GEOSTAR satellite ordered by SES WORLD SKIES. Despite the government shutdown impacting on operations involving several space centers, the spacecraft was successfully shipped by truck from Virginia to Florida. allowing it to enter preparation work for its launch. Pending the successful mission with SES-8, SpaceX will then turnaround their Cape facility for the next Falcon 9 v1.1 launch, realigned to a December 12 NET (No Earlier Than) launch date, per L2 information. This places SpaceX into a stance where they will be launching two missions in the space of a month – a first for the company. Preparations for this launch are in full swing, with a test firing confirmed to have taken place on Friday at SpaceX’s Rocket Development and Test Facility in McGregor, Texas. Following the series of test firings of the first Falcon 9 v1.1 stages, testing the set of nine Merlin 1D engines together as a set, stages for the upcoming launches are expected to enter and depart from Texas at a faster pace, allowing SpaceX to fulfil what is an increasingly busy launch manifest. Next year will open with the next Dragon mission to the International Space Station (ISS), known as Spx-3 (CRS-3), with 2014 including what could be up to three Dragon missions in total. Sandwiched between numerous satellite launches, SpaceX are also hoping to debut their Falcon Heavy launch vehicle – featuring 27 Merlin 1D engines on its first stage. The launch will take place from the company’s SLC-4 launch complex, using the same Transporter Erector that debuted with the Cassiope mission. This device is capable of hosting both the Falcon 9 v1.1 and the Falcon Heavy. Mr. Musk noted he was pleased with how the pad complex – which formerly hosted Atlas and Titan rockets between 1963 and 2005 – performed during its first launch with the Falcon 9 v1.1. “The launch site looks like it’s in great shape, with the exception of some air conditioning ducts that clearly need to be replaced. The fairing air condition ducts got zapped but the strong back and the erector and the stand itself look like they’re in great shape,” noted the SpaceX CEO. 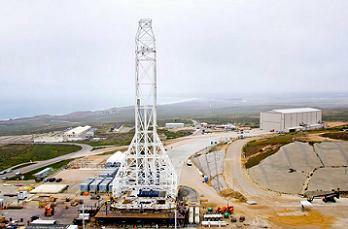 (Images: SpaceX and Orbital and additional information from L2’s SpaceX Section).